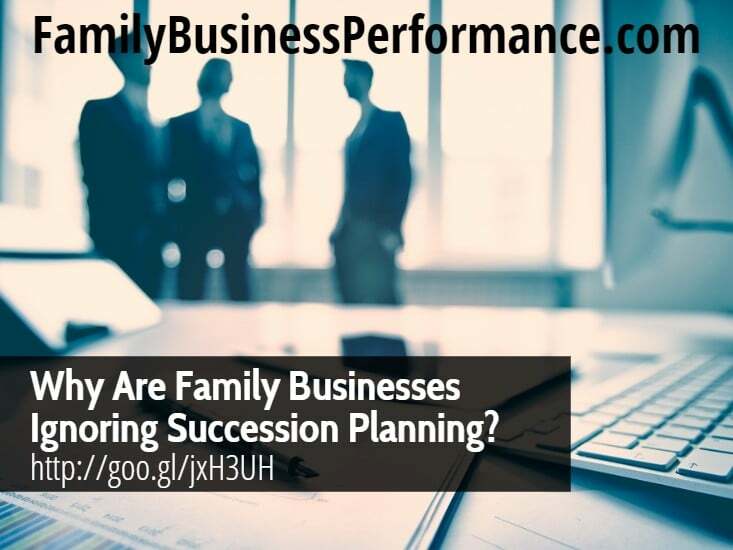 Home » Family Business Blog » Succession » Why Are Family Businesses Ignoring Succession Planning? Why Are Family Businesses Ignoring Succession Planning? Family business thought leaders have had much to say about succession planning lately. Despite all the buzz, a study at Kent State University found that 80% of family businesses do not have a succession plan. Some commonly held misconceptions about succession may be a major contributing factor. Misconception #1: If there are no imminent retirements, succession planning needn’t be a top priority. The current family business leader has years of experience that is an integral part of his or her success as the head of the family business. This cannot be learned or passed down to the next generation like a software download. It will take time to train the next generation to effectively lead the company. Misconception #2: Succession planning is only an issue for big companies. Unstable or inconsistent leadership has greater impact in a small business. This can be detrimental through the family lose of business investment, the business closing, employees losing jobs, communities losing tax base and quality of life and services suffering. Family held businesses need to plan early and invest in the training necessary to help the promoted family members succeed. This may mean seeking outside resources for training and budgeting to provide these services. Misconception #3: It will be easy to choose the family member who will be the next business leader. As a family member moves up the corporate ladder, soft skills become more necessary and valuable components of success – management skills, emotional intelligence, leadership ability, and so forth. However, these skills can be difficult to quantify. To identify and cultivate family members with these skills, the family business needs an instrument to help measure and assess talent. It is advisable to use talent assessment as part of your succession planning processes. Misconception #4: Succession planning only pertains to baby boomers. Succession planning should be an ongoing effort. According to the Small Business Administration, small business owners reported that they would retire on average at age 72. With the mobility of today’s family, the family member expected to lead the next generation could change before the current patriarch or matriarch leaves the family business. Therefore your family business succession plan must be fluid and responsive. Does your family business have a succession plan in place? If not, are you falling victim to one of these commonly held misconceptions?